Each activity is performed by the institute specialists through all the stages – from the selection and creation of a material to its in-service monitoring under different conditions including extreme conditions. 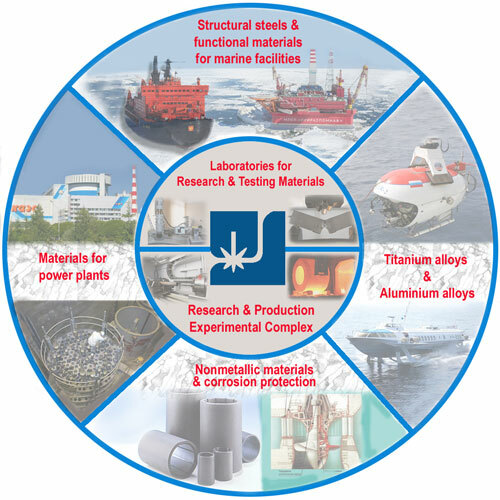 Materials and technologies developed by our Institute are successfully used in many industries: shipbuilding, nuclear power engineering, oil and gas extraction and processing industry, machine building, medicine, agricultural industry, defence industry etc. The specialists of testing laboratories of NRC “Kurchatov Institute” – CRISM “Prometey” carry out the entire set of investigations into the composition, structure, properties of structural, functional and welding consumables and coatings; perform the diagnostics and expert evaluation of materials and projects for compliance with required conditions, lifetime and serviceability prediction of materials and structures. The production facilities of NRC “Kurchatov Institute” – CRISM “Prometey” are designed to try out technological processes of manufacturing new structural base materials and welding consumables developed by the institute.